DEC 22, 2012 MEGATRON MMA LOS ANGELES - Megatron Events, Inc.
National Federation High School Rules. Must make weight in competition singlet! High School Coaches: Register your teams at TMI.150M.COM (Tournament Masters Inc.) by Dec 16, 2012. Youth/Kids: Register at TRACKWRESTLING.COM by Dec 18, 2012. KIDS -- $30 each for individual tournament, through the deadline date of Dec 18, 2012. OVERTIME: NFHS rules. See NFHS website for specific rules. HIGH SCHOOL: 1st - 8th place medals: MEGATRON DOMINANCE AWARD – LOWER, MIDDLE, UPPER. See our AWARDS page for further details! 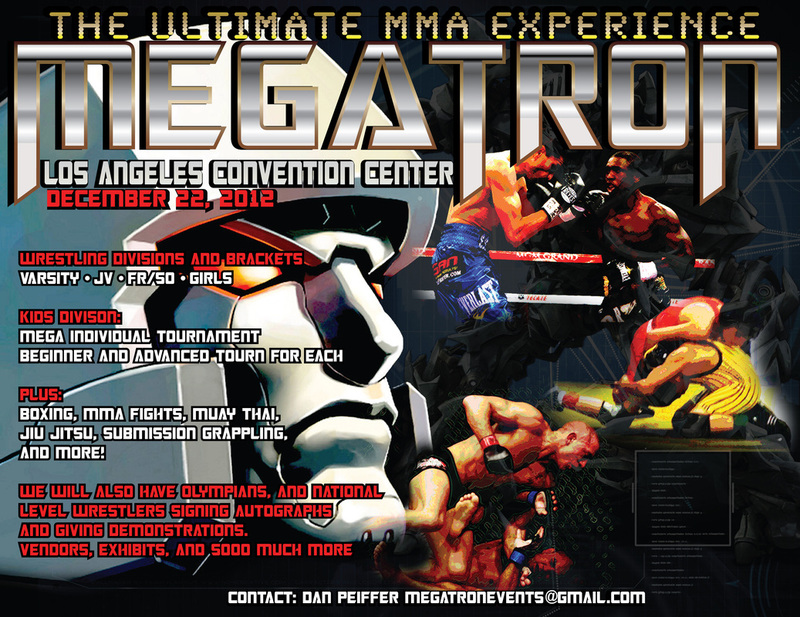 Please click below and read IMPORTANT INFORMATION depending on age category, to ensure your best experience at Megatron Events - MMA LA!